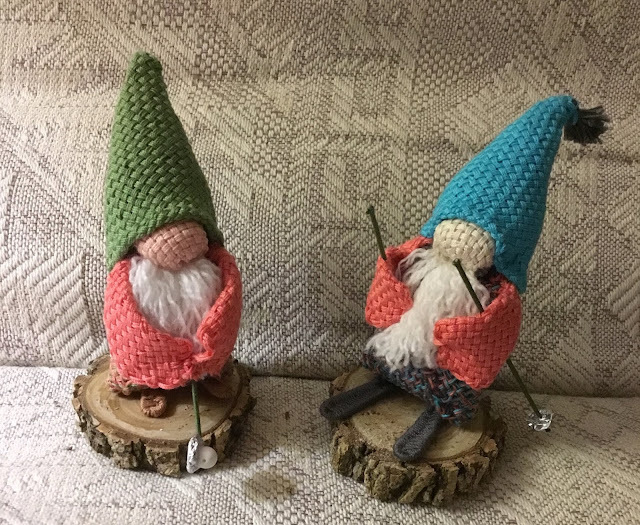 Vicki Bennett agreed to share these pictures of her incredible pin loom gnomes. She has made some great additions to the basic gnome pattern --which is still available at the link. After seeing her wonderfully thematic gnomes, I asked if she was going to do a calendar, with a different gnome for each month. She replied, "I’ve found that doll house items are a good size for accessorizing the gnomes. I have ideas for a calendar but haven’t finished all of them and need to get back to it." 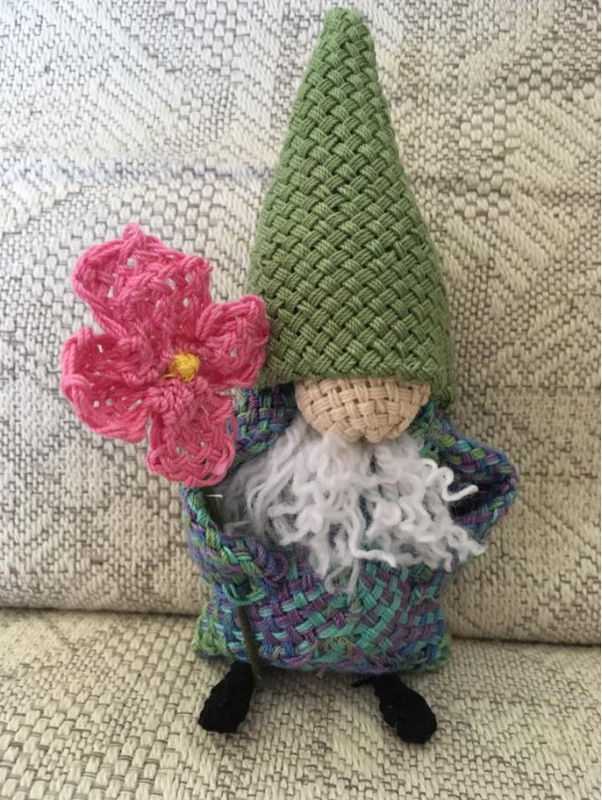 In addition to her artful gnome accessorizing, Vicki has added feet by, I think, using wire or chenille stick wrapped with yarn. I, for one, cannot wait to see a calendar. Can you imagine? St. Patrick gnomes, Valentine gnomes, Christmas gnomes, you could go on and on! This is a blanket, called "All Hands" that appears in Pin Loom Weaving To Go. As you probably notice, not all of the woven pieces are square, about half of the blanket was woven on a variation of the 4" pin loom-- it was woven on a fine gauge adjustable knitting loom. 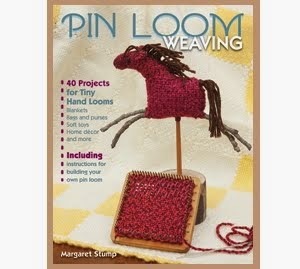 The book includes complete directions with many pictures for weaving on an adjustable knitting loom. Making that blanket was really fun and at least part of the enjoyment was learning that I could complete a perfectly good pin loom weaving on any type of frame that had pins all the way around (if the pins are close enough). This style knitting loom turned out to be particularly fun because you can use the normal pin loom techniques of winding on three layers of yarn, you can achieve the same looped edge so that you match the 4" pin loom PLUS you can change the sett of your weaving by how many warp and weft threads you wind on and can therefor weave with very fine yarn or very thick yarn. 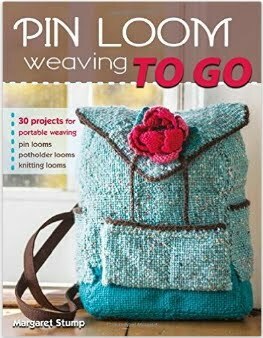 From a PIN LOOM WEAVING TO GO purse pattern. The samples to the right show a bunch of different thread weights, all woven with ease on the same little loom. The plaid looking sample in the bottom left corner was woven with sock yarn, the pale tan sample is very fine linen, the grey sample at 11:00 was woven with extra chunky yarn-- and they all look great! Keep in mind that you need to use a Fine Gauge Knitting Loom for these results, the regular size does not work unless you are only going to be weaving extremely bulky yarn, and if you're going to do that, you probably want to use a larger loom. Having an adjustable 2" loom made it possible to piece the weavings, for example, in the simplified log cabin quilt pattern to the right. 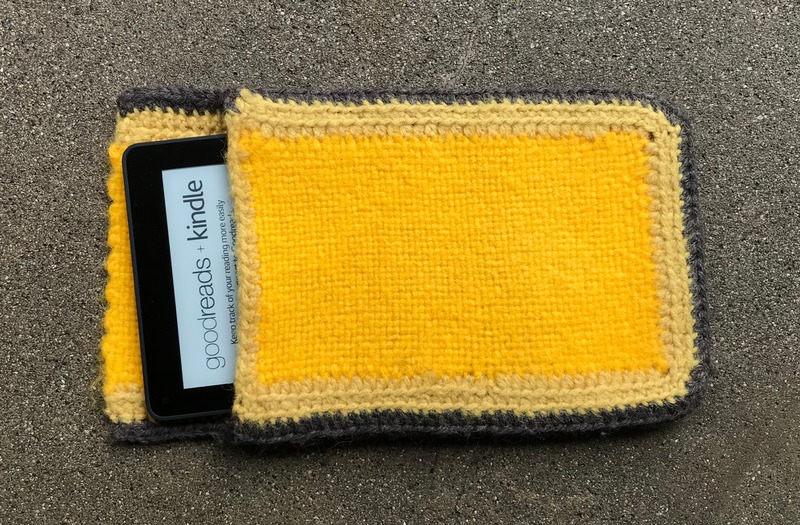 The 2" squares were made on the 2" pin loom that you can build from the pattern in the book. The other pieces were woven on the adjustable loom. 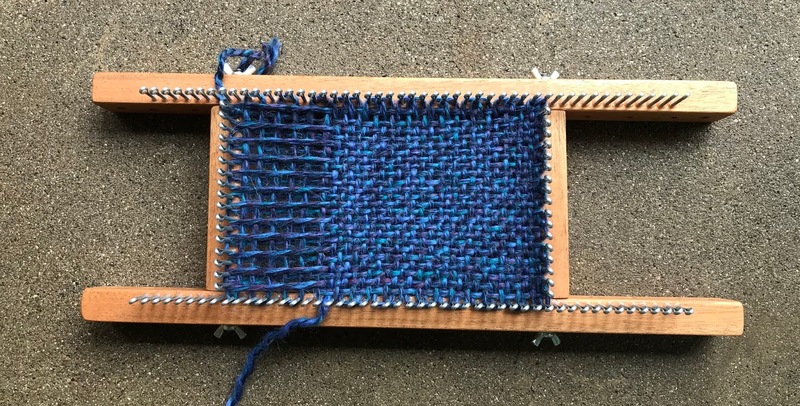 After completing all the items for Pin Loom Weaving To Go, my thoughts turned back to the thrill of having an adjustable pin loom and I decided that if a little loom was fun, a big one could be even more fun. So I special ordered a fine gauge knitting loom that lets me weave 4.5" wide with an adjustable length, the maximum is 12". I ordered this loom with two sets of cross pieces so that I can weave either 4.5 inches wide or 2.5 inches wide. I like being able to weave a thinner strip for blankets. This loom came from Cottage Looms on Etsy. The pins are made with a small size cotter key, which works beautifully and they are set up specifically to work for a right-handed or left handed person. This is the only finished project on my new loom that I have available to show. I did weave a bunch of long 2.5" strips for mug hugs for Christmas presents last year. The tablet bag was woven in two pieces, each 4/5" x 9". The bag is still waiting for a leather edging on the flap, which at my present rate of work, may take a while. I do hope you have as much fun with knitting looms as I have. If you've got questions, write a comment or let me know, my email is in the bottom right column of the home page. Happy weaving! This embroidered pin loom afghan was designed and made in the 60's for a fundraiser by the South Dakota Eastern Star, Bryant chapter. It was won by Hattie Schanck and, over time, handed down to her granddaughter, Karen Schanck. Here is is lying flat on the floor, it is 15 squares wide by 22 squares long, (5" by 7.3"). By the look in these pictures it is in exquisite shape. 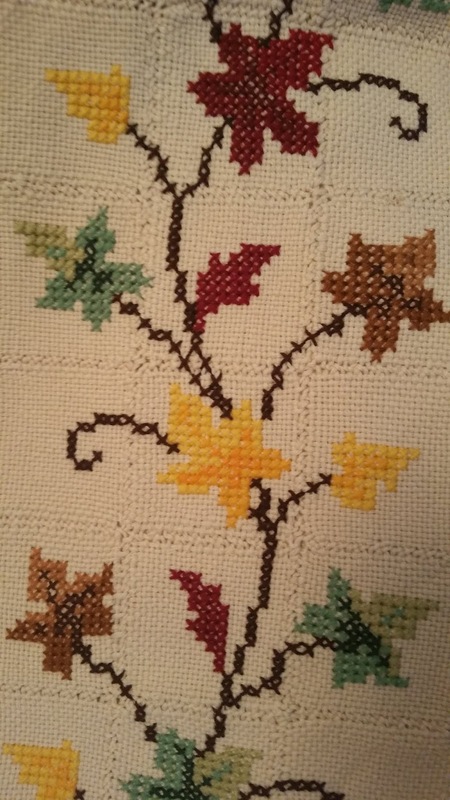 I am astonished by the amount of work that was put in to the cross-stitching, but if you look at the early patterns for pin looms* many of them have this type of embellishment. 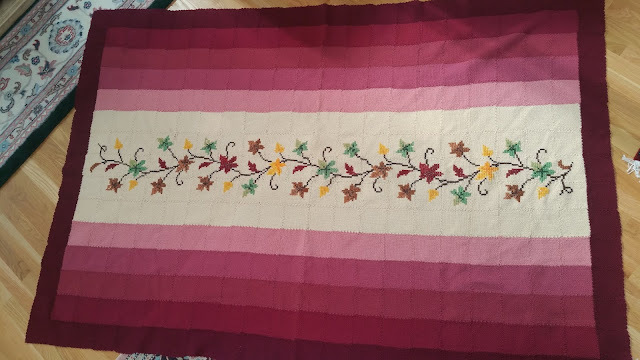 I showed the pictures to a weaver friend who thought that it had likely been made from a purchased pattern. Since the old books were all in black in white, I may have seen it before but just didn't recognize it. I'm really glad to see that the pin loom has its own tradition. 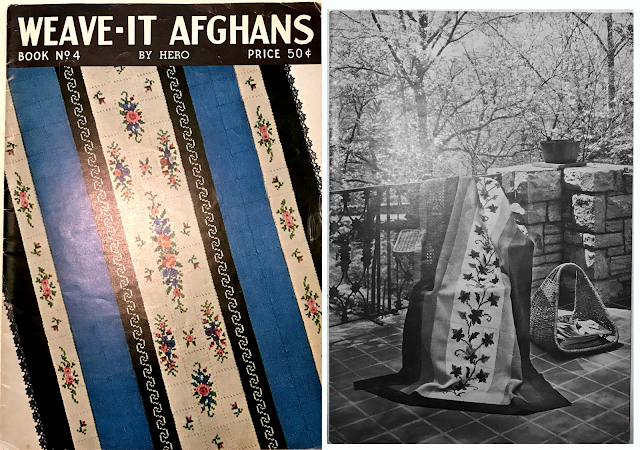 I have heard from a number of people about special warm, woven blankets that had been passed down the family for years but nobody knew how it had been made. Now that knowledge is coming to light. FREE PATTERNS--> *If you are interested in the old pin loom patterns, check out eLoomaNation.com, the ultimate site for all the old pin loom pattern books. (let me know if you see this pattern among them). In addition to being able to download personal use PDF's of the 30's to 60's pattern books which include interesting historical elements such as pin loom woven women's business suits from the 30's, bedjackets and kid's sailor suits, you will find some great books of weaving patterns, which are just as fun and usable today as ever. 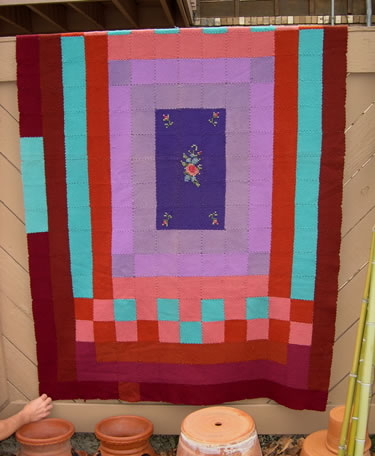 Here's an addition to the story of this classic blanket. Suzanne Eakin of pin loom angel fame as well as swakins note below have found the pattern in WEAVE-IT AFGHANS, Book 4, by Anne Orr. This book of is one of the many available at Eloomanation.com. 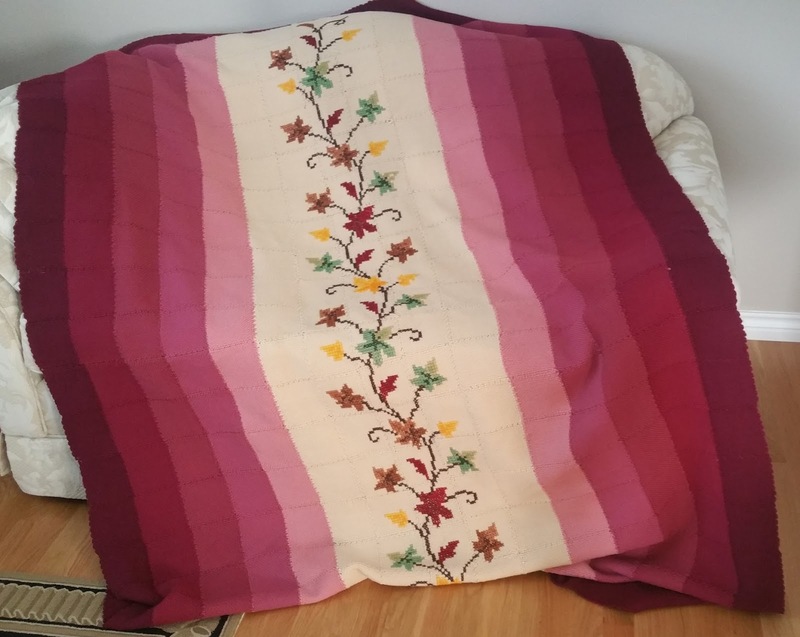 It looks like the weavers of this particular blanket chose to change the color way from autumn tans, orange and browns to reds. One more item. This is a picture that was sent to me a long time ago, I don't have a name attached to it. The interesting thing is that it is probably about as old as the 1960's afghan above, but its kind of a transition piece, with a carefully cross-stitched piece in the middle, surrounded by the lavender/purple squares that are perfectly balanced to a much looser, more open and lively pattern.